Hi Heather, Thanks for this recommendation, I'll definitely check it out! And thank you too for the reminder to breathe. Older son and his girlfriend arrive on Sunday and things have been a lot busier on the work front than they have for sometime (go figure, after leaving me hanging for two months, they finally got their act together this week, just in time for the holidays!) Anyway, I am grateful for the work but will have to re-learn how to fit it around family time. So, yes, breathing is good! I was able to order the book from Amazon here in the U.S. so I guess they have restocked! I'm looking forward to reading it as a break from translating business jargon and acronyms. Isn't that always the way?? Well, hang in there copine, I know that you will make it all work and you know that I am not going to frown on your having work! So breathe and type at the same time! :) And tell yourself that you will have some quiet time in January. I think that you will like the book as I did--so much practical advice. I always suspected that there was some art behind those who seem to just exude savoir-fair and panache. I totally need that book but I'd like a French woman's body too. From what I've observed, clothes seem to hang better on French women because, generally speaking, they are smaller framed than most North American women and that seems to make a big difference.... I'm hosting Christmas dinner this year with 5 of my favourite people and two big dogs. Two big dogs? Really? My goodness, they better behave themselves. Whoever is bringing them into your fine shack better have a strict talking to with them! This is the exact kind of book I have been in search for. You are so lucky to get a chance to encounter both her and her daughter! What a treat that must have been. It really was. I didn't want the afternoon to end! They are both just so funny and smart. And I hope you like the book Sara! I think its great. Hi Heather, your book review is excellent, thank you. Can't wait as I'm a big fan of Tish's writing and personality too. But I'm wondering if she has also touched the secret how despite all the chic and all je ne sait quoi of French women, two beautiful American ladies has stolen hearts of two wonderful Frenchmen so accustomed to proverbial chic. There must be some je ne sais quoi Americain, n'est pas? Happy Holidays to you dear Heather. Happy Holidays to you as well and here is to an excellent 2014! Hi Heather - I've been wanting a copy of this - wanted the hard copy for the illustrations - but was bummed to see it was sold out on Amazon. Nice to know that B&N has it! I thought it would be a great companion for my week in Paris. I totally get what you're saying about feeling the changes that are inevitable in ones 40s, and the challenges of working from home - I used to play dress up every day for my Nordstrom job, now I spend much of my time in yoga clothes and UGGs. I'm trying to find the right balance between comfort and chic, and feeling good from the inside out. Beauty is in the soul and you have it in spades, my dear. As do you, lovely lovely Jeanne. Meeting you was such a treat this year! I think that you will like the illustrations...they are very "you"! And yes, this will be a good take-along for Paris. You can read and compare those chic ladies as they parade in front of you. While it is hard to imagine you in UGGs (it really is), it is good to know that I am not alone. I have been making a tiny effort since reading this and it really makes me feel better. We both have had...interesting years...yes, here is to much happiness for the holidays and for 2014!!! PS: I'm wearing the UGGs right now - still in my PJs, too! I may be able to be convinced to dress in my holiday best later, but for now I'm pretty happy and cozy! Oooh, I would love to see you decked out in your holiday best! Something tells me you have something pretty amazing... :) And yep, I took time to choose the word "interesting"! Merry Christmas and Happy New Year to you too bella!!! I WILL BUY THE BOOK!!!!!!!! All the other FRENCH BLOGS have been suggesting it too but I haven't really listened………..I GOT IT NOW!You got through to me …….YOU RED HEAD FOREVER CHIC AMERICAN GAL STUCK IN FRANCE!I GOT IT! MERRY MERRY……….and lots of HUGS to those BOYS in your life with four paws! Will deliver them!!! And you haven't bought this yet? You will love it. Now, true, you don't need some of this advice as you have it going on already - and I don't think that you will quite buy the "building a wardrobe on neutrals concept" (as I do). But the rest is just really fun. Yes, yes, yes to everything you said. I am actually still reading Forever Chic, in part because my schedule is absolutely crazy (which you know), but also because I am savoring it. When is the last time any of us could say that we are purposely reading a book as slowly as possible, because we want to linger over it for both substance and style? That's also what Tish - and her book - embody perfectly. 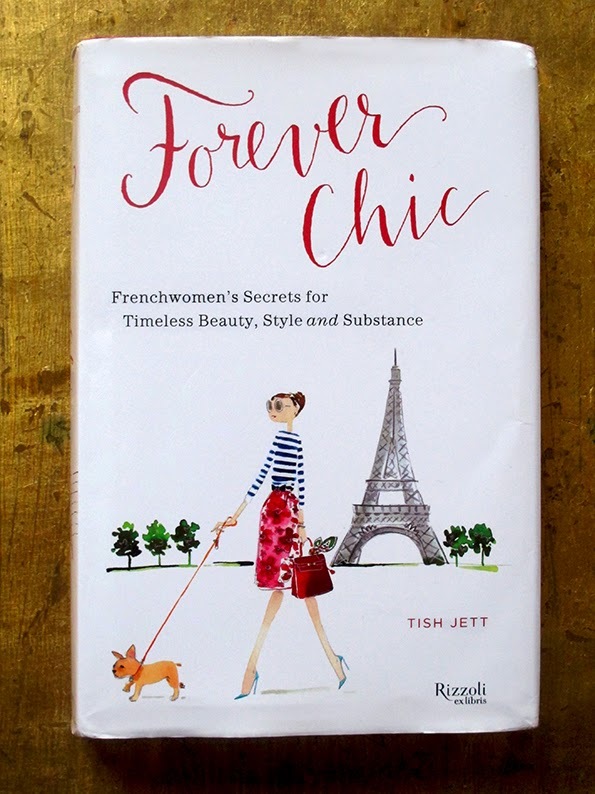 The marriage of substance and style, which she mentions upfront and which many of us who have been fortunate enough to spend time in France come to understand is part of what a French woman learns early on in life. So I am hoping that Tish will forgive me my labored pace through her glorious pages, but it is both circumstantial and intentional. Oh you are right, I am wrong! I read through it so fast--as I wrote to Tish, I couldn't help myself! I am afraid that the whole "discipline" concept is one that I still need to work on. :( But I know that I will go back and reread it and refer to it as well. Forever Chic is certainly needed here, says she who has slopped about in her pjs all day! Loved your review and the links; particularly enjoyed Tish's comment( in her interview with Vicki) that a smile is like a mini facelift. Isn't that fabulous? And so true! I have been tryyying to not hang out in yoga pants all day now. Oof. It is good! Too many blogs write about it. Not you too. Indeed nice told but not your topic. I really considered carefully to reply without make a gaffe . Sorry, Heather. No need to apologize Mumbai. You were polite and clear in your response. But I don't agree with you, I have to say. If so many of us have written about this book it is because Tish is a dearly loved and respected figure in the blogging community. We weren't asked to write about it or sent copies by Rizzoli, we all just want to--because the book is great. It really is. And honestly, if I thought that a book would be appreciated by my readers on the subject of say, auto mechanics or quantuum physics, then I would suggest that too. While I use my life in France as a basis for the blog, I don't ever want to feel trapped by being "on topic"--so I don't have one! :) Makes life eaiser. Ah, I disagree with Mumbai! LIFE is your topic! Life in France is your topic, the tiny things that make life beautiful is your topic. This sounds like a wonderful book! I agree that French women seem way put together, but I also like the comment above that mention the Frenchmen, Remi included, that have chosen very beautiful soulful American women as their mates! (YOU). Christmastime is a good time to say "thank you" for your year-round gifts to us of visual feasts and reminders of mindfulness! The holiday time is busy here, and nice, but is missing a certain redhead who has that je ne sais quoi - wait, I know what: funny-ness, warmth, beauty, LOVE!! What a wonderful, wonderful review. Thank you, thank you, thank you. Andrea and I had so much fun with you in Arles. We must figure out a way to meet in Paris or in your corner of the world in 2014. Let's make that a resolution. Oh I am so glad that you enjoyed it Tish. I really enjoyed writing about the book! And wow did you put a lot into it. I know that I will go back to it again and again. And yes! I would love to make that resolution...either here or there! Love to you and Andrea both and here is to a fantastic 2014 ahead! I've got to say this is the first I've heard of the book. . .that might be counter to Mumbai's comments, but some of us really do read a variety of blogs which provide a snippet of a glimpse into an area or lifestyle, so yours is the one that keeps me abreast of things like this book. I'll have to get a copy. . .if it can tranform this just-turned-60-blue-jean-clad travel blogger into a 'chic' 60 blue-jean-clad-travel blogger then it will be money well spent! I may have to start reading Tish's blog as well! Merry Christmas to you Heather, Remi, Ben and Kipling! Jackie, you are 60??? You look great. :) Well, your happiness and interest in the world shows too! And actually Tish talks about in her book about the importance of being interested and connected as a vital part of staying young. I certainly see that in my Mom--she actually seems younger than I do in that respect most of the time! I would hiiiigly recommend taking a look at Tish's blog. It is wonderful--she is funny, grounded and tells it like she sees it! And the book is great--I don't know about you, but a lot of these tips did me good--they all make sense, there is no fancy-pants aspect--good for a blue jean clad traveller! Yep, 60! I am concluding the celebratory year: six months leading up to that big round number and the first six months after entering a new decade. Sounds like it is time for Tish's book and blog. Merry Christmas!! That is fantastic Jackie. It sounds like you have a great attitude--I think that makes all the difference! This is probably a book I need to read. Like you, I love to feel comfortable and lounge around in fleece pants and old sweaters with my hair in a mess (I won't even dare to call it a bun or anything like that) but I secretly admire women who make an effort and always look so very chic. I still have a lot to learn. Oh my gosh, I think that most of us do. But what I like best about the book is not necessarily about "if I follow these tips I will look better" it is "if I follow these tips I will feel better"--I need that! So instead of being in yoga pants, I am in skinny stretch jeans--just as comfortable but at least I feel "dressed", do you know what I mean? You describe Tish's book so very well. I have had my copy for a while and find myself picking up and leafing through and re-reading again and again. Many of her beauty tips are inexpensive or we already have the ingredient in our home. Are you ready for Christmas? I have not had a chance to read my favourite blogs in a while, hope to catch up over the holidays. Our art show is February and lots of activity and commitments. PS. My art partners and I are coming to Provence in September 2014. Let's meet? Are you kidding???? Absolutely!!!! I would LOVE to meet you Helen. Oh and I am just so thrilled for you too. Provence in September is my favorite, it really is. The light is amazing--you will be over the moon for it. Feel free to email me at robinsonheather (at) yahoo.com if I can help in the planning if needed!! And yes, I have her book on my desk and keep referring to it as well. As someone who is on a nearly inexistant beauty budget, I so appreciate that nearly all of it is not about the money too. "...what is pleasing to the eye is uplifting to the spirit, and that what is nourishing for the spirit is what makes life worth-living"
hehehehe Hélas, ooups...c'est vraie! Et cette phrase...c'est l'essence du livre et j'adore! That inner calm and poise that seems so light: forever chic. Should I get the book for Mrs. Abstract? Wonderful review (to add to your many other generous qualities). Best wishes for Christmas and 2014 to you and Remi. Thank you so much, Edgar. I wish the same for you and Mrs. Abstract. I know that this must be a very important time of year for you both. The bells of St Trophime rang long this morning--so beautiful. As for the book, you would know better than I if she would appreciate it or not. It is not about "how to stay young" but as you so perfectly understood, about how to lightly be a slightly more pulled together version of yourself so as to better express all of the good inner stuff. I am sure that you have some lovely gifts up your sleeve already! 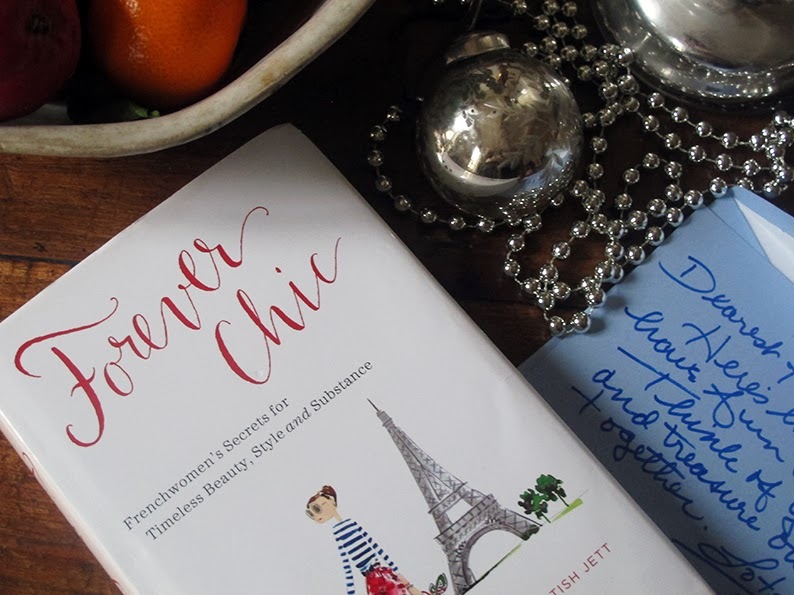 I will definitely be purchasing Forever Chic, Heather...Tish is an amazing woman and the review you have written here is excellent! Thank you so much, Catherine. I think of YOU as forever chic but I still bet that you would enjoy the book! I wish you also a very merry Christmas, and all the best for the New Year 2014 for you and your band of four! Merci beaucoup Silke! Joyeux fêtes à vous aussi! What a lovely holiday post. Merry Christmas to you, Remi and the pups. Enjoy! What are you guys doing for NYE? And you know I loved the redhead-temper bit. Je t'adore. xo. We are off to the rental cabanon soon and for NYE. After all those years in NYC I like a quiet beginning of the new year and there is no place better! Cooking, naps, fire in the fireplace, repeat! Wishing you a festive one though Miss, mix up those cocktails and enjoy!! !